NEW DELHI: Using UIDAI, Prime Minister Narendra Modi-led NDA government has launched a Biometric Attendance System (BAS) for government employees. Attendance.gov.in has been launched to keep a track on the attendance records of employees. Aadhaar number is essential for registering an employee in BAS. The Attendance IDs of employees will be generated from their Aadhaar numbers. The 6 digit number will be generated based on the last 6 or first 6 digits of the person’s Aadhaar number. The attendance ID will only be active when the employee’s Aadhaar information has been verified by UIDAI and activated by the Nodal officer. The employees will be required to enter their 6-digit Attendance ID on the terminal and subsequently the system will ask for finger print verification. The staff will be able to mark attendance in any bio-metric terminal installed in various Central Government buildings. Since network connectivity is essential for marking attendance, the government is planning two types of connectivity with each attendance terminal; wi-fi on NICNET/broadband and SIM based GSM connectivity on tablets. 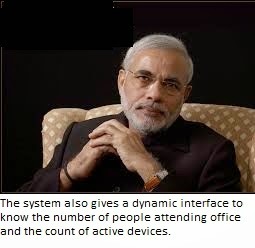 The system will not only help track the number of registered organisations and employees, but also give a dynamic interface to know the number of people attending office and the count of active devices.